Flowserve is the recognized world leader in supplying pumps, valves, seals automation and services to the power, oil, gas, chemical and other industries. With more than 14,000 employees in more than 56 countries, they combine their global reach with a local presence. 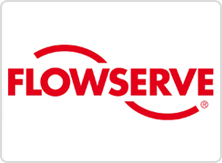 Approximately 50 vendors supply parts to Flowserve Corporation. An application was needed to allow on-line access to purchase order requests by the suppliers. 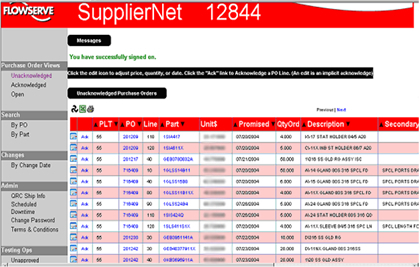 Also, Flowserve buyers needed to be able to monitor these purchase orders to approve changes and monitor supply chain. PlanetJ worked with Flowserve's Flow Solutions Division to create a Web based application for suppliers and buyers to access and manage purchase orders. This was done quickly and easily using WOW (Web Object Wizard). WOW seamlessly connected to Flowserve's backend PRMS based iSeries and automatically generated the user interfaces. Flowserve is a very large, multinational organization producing and selling pumps, mechanical seals, valves and actuators. They also specialize in the service of such items and have numerous employees and various divisions. Coordinating production with dozens of suppliers is a complex task. A real time, efficient, and flexible solution was needed to allow suppliers to view open purchase orders, indicate PO changes in terms of quantity, price, and delivery date. This information needed to come from Flowserve's iSeries PRMS system in real-time. WOW's ability to create Internet applications from existing iSeries database files significantly decreased development time. The project only required about 4 weeks of development and was almost completely developed with WOW features ~ a bit of custom development was required based on Flowserve's project requirements. 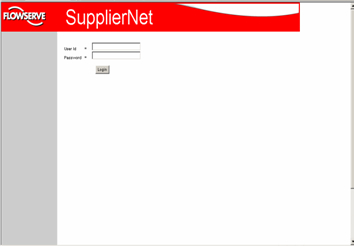 "SupplierNet" solution built for Flowserve Corporation is described below. WOW authenticates the Flowserve designated user ID and password against a backend iSeries database. With proper authentication, the user is able to access information. If not, error message will be posted. PlanetJ's WOW tool created a fully functional application that streamlines supplier interaction with FlowServe's purchasing department. WOW did all this in 4 weeks with real-time and secure access to IBM's iSeries. When asked if she would recommend the use of WOW, Mylene Ortiz of Flowserve stated "Definitely. It is a great way to jumpstart producing your Web applications." Also the speed of development is "Very fast….you can have something in minutes." Development using standard tools would have required many months of development. Contact PlanetJ to see how WOW can solve your Web application challenges.